The Custom BIC Clic Stic Ice Promotional makes a creative billboard for your logo. Enjoy promo BIC quality with Easy-Glide System Ink that provides super-smooth writing for a great custom pen. Popular promo BIC custom pen now made with 76% pre-consumer recycled material. One of the most popular retractable pens in promotional products, this BIC Clic Stic imprinted pen features a break-resistant pocket clip. Experience America's best-selling custom BIC Clic Promotional Pen. Eco-Friendly. This BIC WideBody Retractable Imprinted Pen is available in over 350 color combinations and a variety of inks. This is a great chance to show off your company's brand colors and SAVE BIG! Available in your choice of black, blue or red ink. The promo BIC Pivo Twist Action Custom Pen is a colorful and stylish twist pen. Get your logo noticed on the barrel of these BIC custom imprinted pens. Mix & match the clip, barrel & tip with this Custom BIC Clic Stic Promotional Pen and at a budget price. The promo BIC Pivo Chrome Twist Action Custom Pen is a great gift everyone can enjoy. The BIC Image Custom Pen is an upgrade to its brand, with a colorful BIC Boy cut-out visible on both sides of the barrel. This pen offers a partnership to display your company on a trusted brand. This four-color promotional pen delivers four times the usefulness and four times the gratitude! 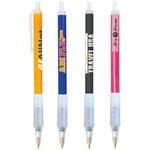 This promo BIC roller ball imprinted pen has a visible ink supply and smooth writing.